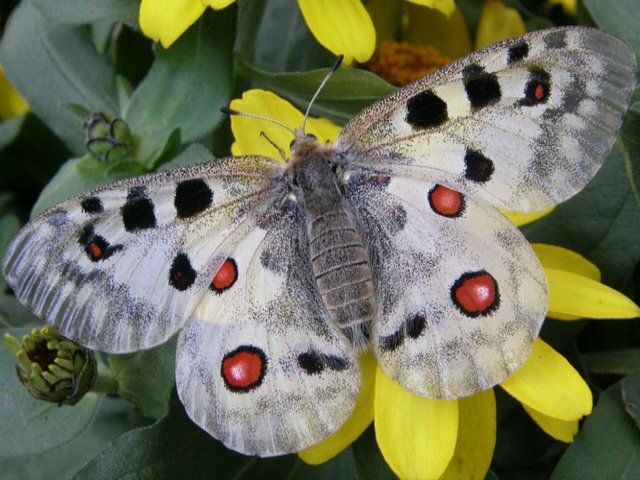 The Apollo butterfly (Parnassius Apollo) or Mountain Apollo is a beautiful white butterfly from the Papilionidae family, decorated with large black and red 'eye' spots on the wings. The Apollo butterflies are widespread all over the world and are typical mountain species, which require cold winter, sunny summer and wide open spaces. They prefer to feed in mid-summer with nectar on meadows and pastures of the continental European mountains in Spain, Scandinavia and Central Europe, in the Balkans up to northern Greece, in the Alps between Italy and France and some areas of the central Asia. The bright eye spots on the wings are defensive mechanisms in place to divert the attention of the predators to less vital components of the butterfly’s body or for surprising the predator.